It’s been a busy and interesting couple of weeks here in the Kansas Legislature. I had kids from Lincoln Elementary visit for a day, sat on a town hall discussion on transparency, and participated in some robust committee debate. I thought I’d run through the ups and downs of the past few weeks. Students from Lincoln visiting the Capitol. Hands down. Four sixth grade students – along with teachers Sarah Nicks and Carly Torres – got up really early in the morning to work as pages for the House of Representatives. I had fun visiting with them, and I hope they had a good time, too. My post-visit queries have revealed their favorite parts were the “puppy chow” purchased at the snack bar, and the tour of the dome. The four students were Aiden Kimball, Israel Vazquez, Nadia Hardcastle and Hayley Waymire. House Bill 2643, which is being heard in the House Higher Education Budget committee. The gist of this legislation is that after 14 years of offering in-state tuition to immigrant children – commonly known as Dreamers, under DACA – we’d start charging out-of-state tuition rates. Then, apparently because people’s lives are some sort of game or sport for people like Kris Kobach – the bill says that the money will be used to offset expenses related to tuition waivers for foster kids. It’s like some sort of weird version of Hunger Games, where Dreamer is pitted against Foster kid, and they get to fight it out over the crumbs while the jerks in the Capitol City get to watch on TV. My main issue with this bill is that it is I believe it is 100 percent, wholly political in nature. In my opinion, it’s designed to ignite some talking points, or elevate some anti-immigrant rhetoric, but disguise it as a policy discussion. Whatever your take is on the issue of immigration, I would like to think that we could agree that people’s lives shouldn’t be used as sport or entertainment – and neither should the policy we discuss that might affect them. For the record, there are 670 kids who benefit under the in-state tuition provision – .37% of the entire Kansas college population. We’ve been offering in-state tuition for more than a decade, to students who live here and attend high school here, and who are trying to become citizens. They are, for all intents and purposes, Kansans. I haven’t seen any testimony from colleges saying they’d like to end this. The only proponent so far has been Kobach and his principle argument is that we’ve run afoul of federal immigration law. But when it comes to running afoul of the law (ahem – voting rights), few people have done that more than Kobach. Furthermore, colleges waive tuition for foster care kids, and it’s not overly burdensome. To lay out the idea that we’re going to take money saved from one group and transfer it to another is rubbish. The bill doesn’t help a single person. It only harms people, and that, however you look at it, is bad policy. (Note: If you read the language of the bill, it’s sort of mealy-mouthed. It’s not making a clear statement about whether to end the in-state tuition, or to penalize colleges if they continue to provide in-state tuition. But it seems that if a college offers in-state tuition to a Dreamer, they have to take the difference between in-state and out-of-state and set it aside for foster kids who want to go to college. So, in effect, charging someone out-of-state tuition for these kids. The language is ambiguous, at best). Probably the biggest piece of legislation to emerge from my committees has been the Cyber-security bill from the House government, technology and security committee. (We also worked a second version). The committee members did a great deal of work on this, and gathered a lot of input from stakeholders, to help create a good piece of legislation. It creates a framework for the state to better solidify its information security systems, which are not as strong as they should be to resist outside attacks. This is an important concern, and with the committee’s efforts, it is also refined in scope and cost. There was a lot of concern that it would cost local communities a lot of money, but after the committee put a lot of effort into it, we limited the bill to the Executive branch, and ensured the protection will cost no more than it does today. There’s no telling what the final version might look like, but this version is a well-worked bill that, I think, serves as a good example of how the process can work effectively. Here’s a run down of some of the bills we heard on the floor – courtesy of the minority party office staff, which does a great job up here! 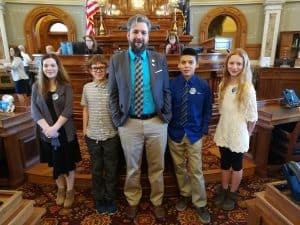 HB 2455: This bill will amend one of the statutory duties of the Kansas Juvenile Justice Oversight Committee (Juvenile Oversight Committee) to require the Juvenile Oversight Committee to “monitor,” rather than “calculate,” any state expenditures that have been avoided by reductions in the number of youth placed in out-of-home placements. HB 2444: This bill will repeal language that prohibited the Kansas Public Employees Retirement System (KPERS or the State Employee Retirement System) from investing in companies with operations in Sudan and related reporting requirements to the Legislature. HB 2456: This bill will amend the statute governing probation term limits and overall case length limits in the Kansas Revised Juvenile Justice Code to clarify that when such limits are tolled due to the offender absconding from supervision while on probation. HB 2505: This bill will clarify when a mayor is considered a member of a governing body based on the form of government utilized by a city. HB 2506: This bill will allow cities, as well as certain organizations as authorized by current law, to take temporary possession of abandoned property for purposes of rehabilitating the property. HB 2476: This bill will create and amend law related to the sale of alcoholic candy and to the sale of domestic beer in refillable containers. The bill would define “alcoholic candy” as any candy or other confectionary product with an alcohol content greater than 0.5 percent alcohol by volume. HB 2435: This bill will amend the Kansas 911 Act (Act). The bill would change the frequency that Legislative Post Audit is required to conduct an audit of the state 911 system from every three years to every five years. HB 2547: This bill will extend the terms of current Kansas State Fair Board members to expire on October 15 in the year in which the member’s term would have expired. HB 2556: This bill will establish the State Interoperability Advisory Committee (Committee) in statute. Currently, a State Interoperability Executive Committee exists by executive order. Monday is the last day for bills to get out of committee. Then we’ll have three big days on the House floor ahead of “turnaround.” This is when the House and the Senate tag each other and start working the other chamber’s bills. So what do you think will happen with HB 2643 when it comes out of committee? What will happen next with that? I don’t think this bill has the support to get out of committee. Keep up the good work Jason. I missed you at the PTK luncheon on Thursday. Keep up the good work Jason. Missed you at the PTK luncheon on Thursday in Topeka. Thanks, Terry. I had the PTK luncheon on my calendar, but the water committee was called back to meet again after the House session. Sorry to have missed you. I appreciate your position on 2643. I agree that it is purely political and mean-spirited to pit Dreamers against foster kids, especially given the fact that many foster kids who age out of the system have tuition waivers anyway. Love this!!! We had a blast! I learned a lot as well! Thank you for trying to figure out how to encourage people in Hutchinson to fix up their properties. My son was really impressed with your desire to figure out how to reach the Hispanic community.